When most people pull off southbound Highway 101 into the parking lot shared by Mr. Fish and a pawn shop, they're probably looking to bring home a few pounds of fresh crab or make a few bucks off that old guitar that's been taking up closet space -- but not local artist and gallery owner Jack Sewell. He's there for a very different purpose. He parks his truck on the far north side of the lot in front of three large, bay doors that used to be Eureka Truck Terminal. The warehouse houses Sewell's most ambitious sculpture project to date -- a work in progress that, if all goes as planned, will be ready for installation at the foot of C street by Arts Alive! on Saturday. Sewell's sculpture project began last May as a proposal in response to the Eureka Art and Culture Commission's call for artist submissions describing ideas for a large, permanent, water-feature sculpture. Creation of a piece based on the winning design would be funded with redevelopment money and installed at the foot of C Street in the new Market Square area near the recently redeveloped Fishermen's Terminal. 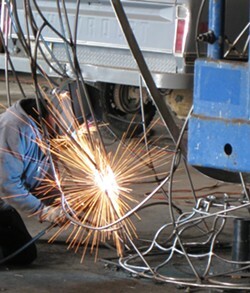 Sewell's proposal was selected from among many, and he began building his sculpture last December. 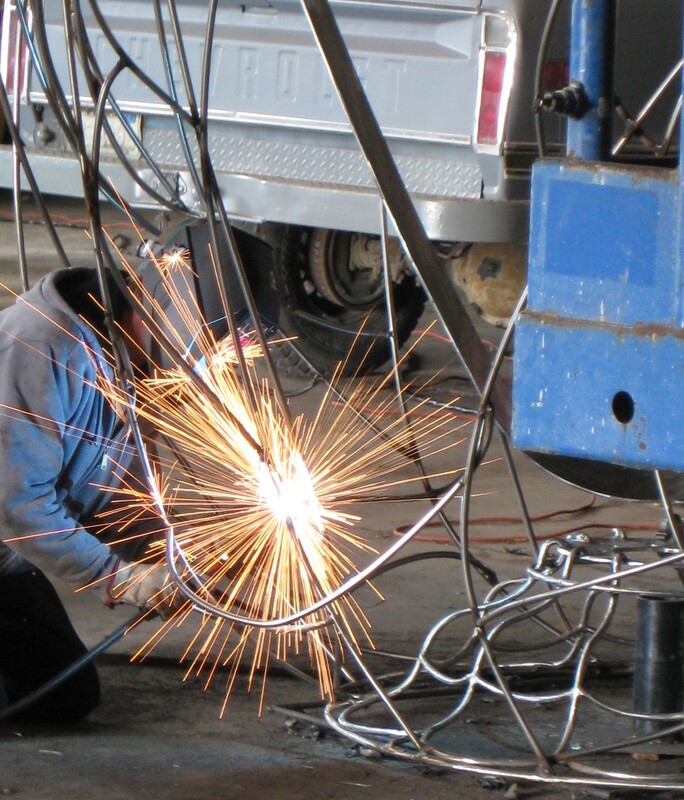 Now, 700 pounds of stainless steel and $30,000 later, Sewell is on the home stretch. I went to see the work in progress at Sewell's Broadway warehouse workspace in early March. Walking into the dimly lit warehouse from the daylight was a bit disorienting. Sounds of ignition and bursts of torchlight provided moments of intense, perception-altering illumination. When my eyes adjusted, I was confronted with a central loop of stainless steel standing over 20 feet high, roughly outlining the shape of a sail. The movement of the line and its scale are eye-catching, and the open space invites the viewer into the piece, titled Following Current Events. On the day that I visited with Sewell, a large propeller was lying, tilted, next to an old, gray pickup truck, and larger-than-life aluminum birds were propped near a beat-up, blue lift: elements of the piece that were finished but not yet incorporated into the whole. But Sewell's clear, enthusiastic description of how the parts would come together brought his vision to life. The piece will be installed in a pond (already completed at the C Street location) with jets providing moving water currents. 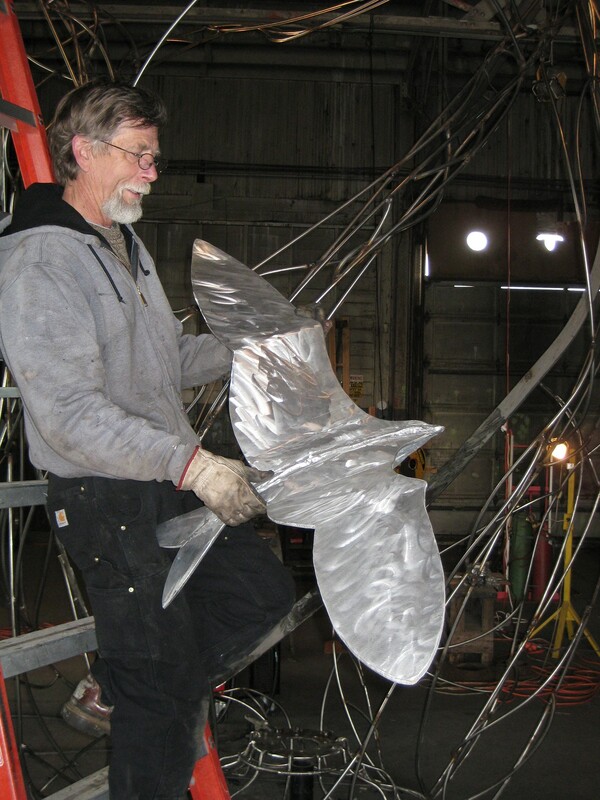 The currents will rotate a large-bladed propeller that will be mounted at the base of the piece. The rotation of this prop will, in turn, slowly rotate the entire 23-foot sculpture. When it's windy (more often than not at the foot of C) the "sail" will catch the wind and either fight or aid the rotational direction provided by the current. 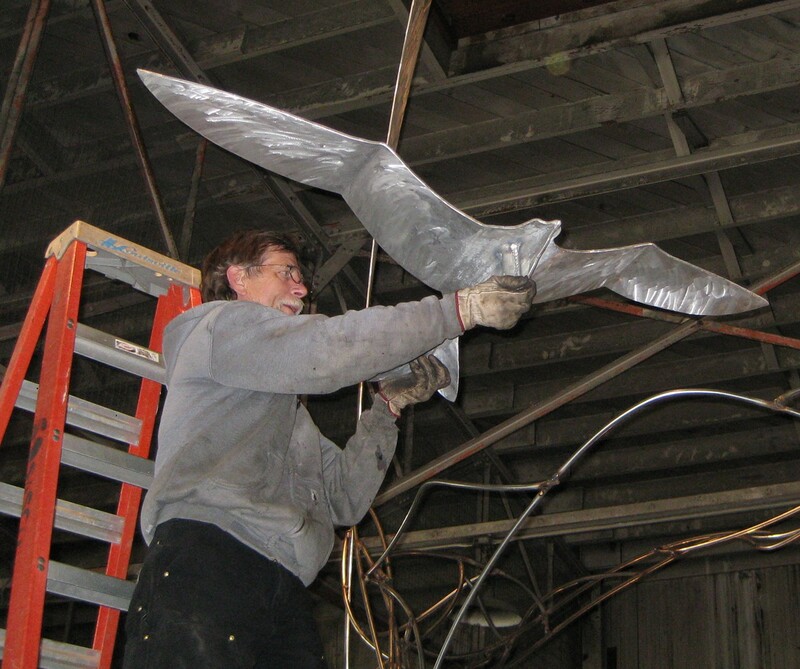 The final kinetic element of the piece comes in the form of three large, aluminum birds that will be suspended at three different points around the loop between 11 and 15 feet high. The birds will be mounted on swivels, allowing them to move with the wind independently from the rest of the piece. In short, a beautifully envisioned and designed form will bring a lot of steel and a lot of movement to the foot of C Street. Eureka has long been trying to become an arts destination and in recent years it seems to be getting closer that goal. The city is home to many galleries (Sewell's among them), museums and art spaces. Arts Alive! has become an important monthly event for the local arts and business communities. "The more public art the better!" declared Swell. For Sewell, the importance of public art seems to go beyond simply signifying a community's interest in the arts. "Every chance you get to kind of take someone out of their cell phone mode and over into looking at something and taking their minds off of things for just a few moments, well then public art has been successful to that degree," Sewell said. Reflecting on the project's completion, Sewell has modest hopes. "Maybe there'll be a few people that'll sit and watch this spin around for a while; that'd be good for me," he said, smiling. Following Current Events will certainly offer visitors to the Market Square/Fisherman's Terminal area something different to enjoy and contemplate. The content of the sculpture and the location are significant. They bring together two key elements that are largely responsible for making Eureka such a unique place to live and visit: a burgeoning art scene and the long established fishing tradition that has done so much to build and shape our community. Sewell's sculpture may, like a shock of perception-altering torchlight, allow us for a few moments to see ourselves, and the place we are standing, just a little bit differently.